Material handling radial dust collecting fans and fume exhaust blowers, fume collectors and air-fan scrubbers high pressure blowers supply. Industrial sales of high temperature blowers, fume exhaust fans and ventilators, centrifugal and axial inline fans and radial fume exhaust ventilator blower fans for OEM fume exhausters. Centrifugal and axial Chicago Blower - Canada fans and high temperature ventilators. Designed as vertical packed columns counter-flow systems for the efficient separation of gas-solid or gas-liquid and horizontal cross flow chambers for ease in maintenance. 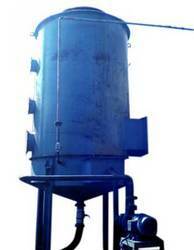 Units are available in stainless steel and mild steel construction, as well as in PVC and FRP. Home | Site Map | All Rights Reserved. Oleg Systems Ltd. Copyright © 2001-2013, Canada. Production of air scrubber blowers, fume collector fans, positive displacement blowers, Aeroven Blowers, Twin City, NYB fans, blowers & fans repair and rebuild, Lau fans, plug fans ventilators, sheldons fans blowers, cooling fans, FRP ventilators, industrial mancoolers, Cincinnati fans / blowers, air polution control ventilators, blowers and fan exhaust systems, air make-up fans, air knife pressure blowers, high pressure blowoff fans, burner blowers, combustion process fans, conveyor blow-off fans, air canon fans, dust collector blowers, finishing systems fans, fan exhausters, fume exhaust ventilators, furnace fan blowers, incinerator fans. Canada Blower MHO Industrial Radial Paddle Fan: The open type radial paddle fan wheel design is extremely rugged using heavy-gauge steel components which are jig assembled for accuracy and consistency. All blower wheels are welded with care to insure the maximum in strength and reliability. MHO fan wheels are suitable for general handling of coarse, sticky, heavy, and / or abrasive materials. Canada Blower MHR Industrial Radial Paddle Fan: The MHR wheel is similar to the MHO blower wheel, with the addition of end rings. MHR blower construction is standard on size 26 and larger Class 3 fans. MHR blower wheels are suitable for general handling of coarse, sticky, heavy, and/or abrasive materials. Canada Blower MHA Industrial Radial Air Handling Fan: The MHA wheel is a more efficient type of blower wheel and is used when handling relatively clean air, fumes, vapor exhaust, and air with a light contaminant. The fan wheel is constructed with heavy-gauge blades welded to both backplate and front ring. Canada Blower MHW Industrial Radial Backplate Wool Wheel: The MHW blower wheel is constructed to prevent paper shreddings, threads from buffing system exhaust, and other similar matter from hanging up on and wrapping around the spiders and fan blades. Fan applications include long, stringy or fibrous materials. MHP Industrial Radial Paper Handling Wheel: This modified MHW fan wheel features trapezoidal gussets for the extra rugged construction necessary when handling corrugated paper trims, fibrous material, metal trim, and other high impact loading material. A paper deflector cone over the face of the hub helps prevent wrapping of paper around the hub or leading edge of the blower blades. All MHP fans are supplied with bearing stop blocks and a relieved inlet transition. The relieved inlet transition smooths the flow of paper trim and similar material through the fan.